Apologies for the name but it does fit in perfectly with the tone of the review. I guess if you are reading this, you have already heard of a large amount of the “myths” surrounding Speedplay pedals. There is one article in particular that pops up in just about every debate on Speedplay pedals in which the reviewer is completely biased to Look, both shoes and cleats. Not going to link it here, so don’t ask. This isn’t a product comparison but a single product review. Anyway, I finally got my own set of Speedplays during the week and have now done a few rides on them so it is time to report back. I got myself some Speedplay Zero Chrome-Moly Pedals, the guys on the right. Yes they are the cheapest that Speedplay offers but that would be due to the weight limit of 85kg that they have on their other pedals. Unlike the standard SPD pedals I’d been using, some Shimano 105s, these required quite a bit more work to get setup. In part because of the extra mounting plate that is required, but also in part because you need to adjust the float screws independently. Now don’t get me wrong, having independent float screws is a HUGE feature and not something I’d remove. I would like some shoes that support 4 hole mounting and I think Speedplay could do some more in this regard. Not all of us can afford custom sole shoes. When you first put them on and clip in having never used them before, yes they are. The amount of float and the looseness of things is a bit crazy. Hell I don’t know if anyone could leave it on the default anyway. Like all new pedals, the clipping in and out process is a bit stiff for the first while. Since Speedplay have the retention mechanism in the cleat, you’ll need to go through the loosing process more often, but since the base is metal, it’ll be a whole lot less frequent. But back to the point, the feeling of walking on ice is there, while the cleats are unadjusted, and you are not moving, and you are standing, and you aren’t really putting pressure on the pedals. Adjust the float and it can return back like standard float in other systems. Close the adjustment screws completely and you remove the float completely should you want it. Once you have the pedals adjusted, most of the feeling goes away. If you are someone who used to have float, but kept the closing method extremely tight, then you’ll most likely still feel some looseness, but if you are keeping things that tight, you loose the benefits of float! When you start riding these, the whole feeling goes away. Quickly. Really really quickly. By 30 minutes into the first ride, I’d forgotten I was using new pedals, pretty much what you want. When sprinting hard, the pedals don’t move around. The whole platform feels very solid and very attached. This will be highly dependant on the shoes. With my Speedplays, I switches to some Sidi Genius 5 shoes. There are older models of these that have a recessed section for 4 hole mounting, pretty much making the cleat flat on the front of the shoe. In my current setup, on grippy material, walking is actually easier than the only SPD-SL stuff I used. Foot is flatter and it really doesn’t get impacted by the large Speedplay cleat. When on tiles however it is a slightly different story. I need to make sure that I do not put pressure on the cleat. Speedplay cleats have a medal base. Metal on tile doesn’t stick. They slide. Not enough to have had my foot actually slip, but enough to feel it. The noise alone is enough to make me be careful so maybe it is just the head playing tricks. Either way, while on the road, it is easier to walk with them. I’m not going to bust this one because it is true. There isn’t one. If you take a ride on Speedplays you’ll quicker realise why. If you have Look Pedals and Shoes and have seen their “memory” positioning for the cleats, you’ll already know why. The angle of the cleat matters. A whole fricking lot. Knock it a degree or two out and your knees with let you know, but only after it is too late. With Speedplays, you set the lateral positioning meaning how close you want your foot to be to the crank. There is some movement in the forward and reverse positions too. After that, you click in and let your foot find its natural position. If you had cleats that tried to force it, it’ll still try and just strain. Trust me, if you have had knee problems, Speedplays could be just the ticket. Just because the pedal is smaller, doesn’t mean you loose any power transfer. Look at the size of that cleat! That is where your foot is putting the power into. That then transfers to the pedal into the spindle. All the arguments about having a smaller area seem to suggest your foot will warp around the pedal which is nuts. First off, your average cycling shoe shouldn’t have a flexible bottom like say a runner. If it does, your off to a bad start and you probably want platform pedals. 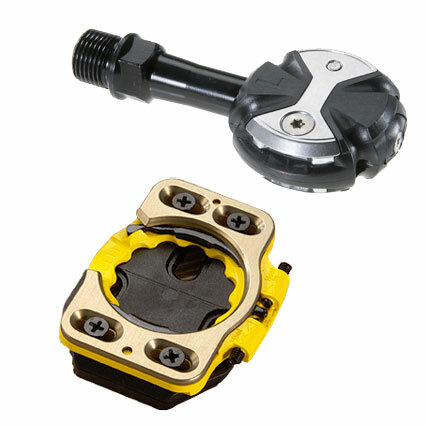 But after this, the area that the huge cleat is supporting covers nearly the full pressure point on the ball of your foot gathering all that power and putting it where it is needed, into the pedals. Speedplays are not without fault. While setting them up, the little adjustment screws to control the float stripped. Each cleat has two to control the inward and outward float – a great system I must say – but the screws are made of two soft a metal. I did eventually get them to turn to what I needed but a stronger screw would have been nice. For Pros who get custom modelled soles, it isn’t an option. Older Sidi Genius shoes supported 4 hole mounts too so that looked good, but the newer stuff doesn’t. It means you are using a converter plate from 3 holes to 4 holes which adds to the stack height. This is still lower than my old SPDs but I would have liked it to be lower again. Probably what I hear the most when talking about Speedplays. They ain’t cheap. The cleats are usually twice the price of SPD style cleats too. Part of this is probably who they are aimed at. Speedplays do not seem to be aimed at your everyday cyclist, more the road warrior or racer, which is a pity. If I had known about Speedplays when I started cycling, it’d have been a no-brainier. Proper clipless road pedals AND double sided entry. Which brings me onto the benefits of Speedplays. Yes there are pedals which have this but very few road pedals, which I find quite strange. I still have marks on my legs from where I didn’t clip in correctly and caught my leg from back when I was starting to cycle. All painful experiences. So much that I can remember the few bad ones pretty vividly. With my Speedplays, yes I’ve had a few times where I didn’t go in immediately, however not once have I slipped off in the month I’ve been using them. Worst is that I simply can’t pull up but I can push down and get some power in. Means I can move away when in traffic. Getting in properly is usually just a case of wiggling my foot and click, in. The base is metal so it should wear better than the plastic SPD systems. Since they are at least twice the cost, they should last twice as long right? Obviously I’ve yet to be using them long enough to know just how long however I’ve quite a bit of walking in my Speedplays due to the ice of late here in Ireland so they do show some wear. Enough that the fronts and visibly tilted in where they contact the ground. While this may seem bad, I have to compare this to my SPD cleats which were pretty tore apart through a much smaller distance walk to work a few months back, and that was with brand new cleats. True I did cycle on the SPD ones for another 4-5 months, but the yellow rubber was long gone, and I stopped just before the plastic got too thin to hold the cleat into the pedal. The Speedplays should be the same and continue going, however they have a long way to go before the wearing causes problems. Worst case I think will be if it wears into the screws so I can’t get to the threads, but there are ways to sort that. After a few cycles I had already made my mind up. I’m completely sold and probably will never use another pedal. I’ve bought another set of Chromos for my new dream bike which I’m building right now, this time in red to match the paint job (its a Cervelo S2 – 2009 colour scheme). For anyone starting road cycling and going clipless, I’d recommend them. Yes they are more expensive, but they are worth it. If you are commuting mainly, there are cheaper options in shoes that you can walk in normally and they are a better option for the commuter. But speedplays for everyone else. Previous PostLa Marmotte 2010 Entry OpenNext PostYou must disable or remove Adblock to visit this website. Where can I get Speedplay cleats in the Greater Dublin area? Just about to get new shoes – I might take cleats off old shoes but I would prefer new ones. Only found out the other day that Cycleways sell speedplays. Would assume they have the cleats too.